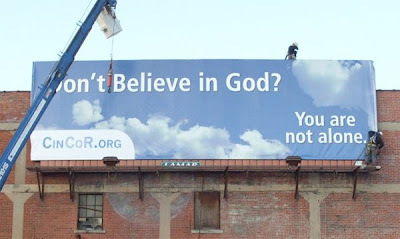 Two days after it went up, yesterday a Cincinnati billboard promoting atheism was removed after the landlord of its site received "multiple serious threats." The group that funded the billboard, the United Coalition of Reason, was contacted by Lamar Advertising of Cincinnati. Lamar reported that the landowner of the site had been threatened over the billboard's message and wanted it taken down. "We weren't given the landowner's identity or precise details," reported Fred Edwords, national director of the United Coalition of Reason. "Nor did we pursue them. It was sufficient to learn that multiple, significant threats had been received and that Lamar would act quickly to alleviate the problem. Lamar was most apologetic to us regarding the situation. It was a development they hadn't expected. Nor had we. Nothing like this has ever happened to us before." "Everything that has happened shows just how vital our message is," said Shawn Jeffers, co-coordinator for the Cincinnati Coalition of Reason. "It proves our point, that bigotry against people who don't believe in a god is still very real in America. Only when we atheists, agnostics and humanists come together and go public about our views will people have a chance to learn that we too are part of the community and deserve respect." The billboard was moved to a less visible location, locals still aren't happy. "I think the sign needs to come down. Its atheist. Its going to cause problems around all the churches, not just Catholic, but Lutheran, baptist, all of them," said one man.